The Zephyr™ RTOS has included support for Bluetooth™ Low Energy (BLE) connectivity since its inception. 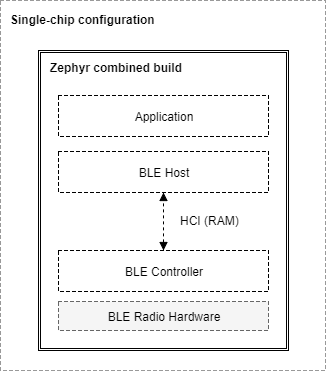 Zephyr OS 1.9 now includes a qualification-ready controller subsystem implementation to allow MCUs with a BLE radio to be connected to a processor running a BLE Host stack. Taking a closer look at the different layers that make up a full BLE protocol stack helps explain this capability. The Bluetooth Specification describes the format in which a BLE Host must communicate with a BLE Controller. This is called the Host Controller Interface (HCI) protocol. HCI can be implemented over a range of different physical transports like UART, SPI or USB. This protocol defines the commands that a Host can send to a Controller and the events that it can expect in return, and also the format for user and protocol data that needs to go over the air. The HCI ensures that different BLE Host and Controller implementations can communicate in a standard way making it possible to combine BLE Hosts and Controllers from different vendors. Dual-chip configuration: Using two separate ICs, one running the Application and the Host, and a second one with the Controller and the Radio Hardware. This is sometimes also called a connectivity-chip configuration. This configuration allows for a wider variety of combinations of Hosts when using the Zephyr OS as a Controller. Since HCI ensures interoperability among Host and Controller implementations, including of course Zephyr’s very own BLE Host and Controller, users of the Zephyr Controller can choose to use whatever Host running on any platform they prefer. For example, the host can be the Linux BLE Host stack (BlueZ) running on any processor capable of supporting Linux. The Host processor may also run Zephyr and the Zephyr OS BLE Host. This configuration is only possible today on Nordic Semiconductor ICs, since they are the only IC family that is fully supported by Zephyr Project’s built-in BLE Controller. In the future however, the project intends to extend this support for many other SoC families, provided that their BLE Radio Hardware interfaces are publicly documented and therefore suitable for an open source implementation. When using a Zephyr OS Host (left side of image), two instances of Zephyr OS must be built with different configurations, yielding two separate images that must be programmed into each of the chips respectively. The Host build image contains the application, the BLE Host and the selected HCI driver (UART or SPI), while the Controller build runs either the hci_uart or the hci_spi app to provide an interface to the BLE Controller. This configuration is not limited to using a Zephyr OS Host, as the right side of the image shows. 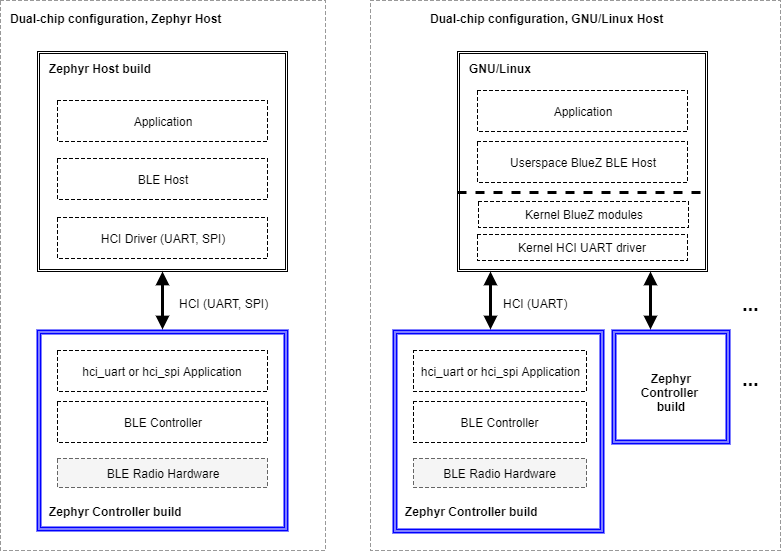 One can indeed take one of the many existing GNU/Linux distributions, most of which include Linux’s own BLE Host (BlueZ), to connect it via UART (SPI is not supported by BlueZ) to one or more instances of the Zephyr OS Controller build. BlueZ as a Host supports multiple Controllers simultaneously for applications that require more than one BLE radio operating at the same time but sharing the same Host stack. In order to use a Zephyr OS Controller build in a commercial product, this needs to go through the Bluetooth Special Interest Group’s (SIG) qualification process. The Controller subsystem must adhere to the Bluetooth Specification and conform to the expected behavior in Bluetooth Low Energy devices. The qualification process is mandatory for all Bluetooth products, and consists of a series of tests defined by the SIG that are run against the particular implementation. Test evidence is then provided to the Bluetooth SIG to prove that the device is indeed compliant before a qualification is granted. As part of this blog post, Nordic Semiconductor is happy to announce that Zephyr OS 1.9 passes all the required HCI and Link Layer conformance tests in order to qualify a design based on an IC of the nRF5x family as a Controller Subsystem. Pre-certification of the Zephyr OS Controller Subsystem allows end-product makers to rapidly develop BLE end-user product with confidence that their solution can be certified. Nordic will make available the qualification QDIDs (Qualified Design IDs) for the combination of the Zephyr OS 1.9 Controller build with our nRF5x series of ICs, which can then be used when qualifying end-products to fast-track product qualification, i.e. Link Layer and HCI tests do not need to be repeated by end-product makers. Note that Nordic’s qualification will only cover the BLE Controller, which means that whichever Host is used for a particular design will have to be qualified independently. In order to test the BLE Controller yourself and verify if it suits the needs of your future product, feel free to grab the 1.9 release and test it out!